Olive trees and grass surround the vines at Domaine de Collin, where this bio-diverse farm in the Limoux region produces delightful, balanced wines, naturally. 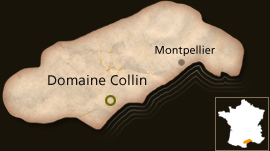 The Domaine controls the entire process from vineyard to the bottle. The vines are worked without chemical fertilizers or weed killers. 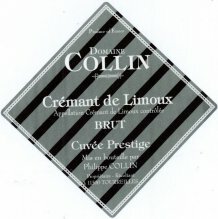 Raised by a vigneron in the Champagne region, Collin brought his knowledge of champagne to the Languedoc. He dedicates the majority of the vineyard to chardonnay, pinot noir, chenin grapes and a smaller fraction to merlot, syrah and cabernet sauvignon. The altitude, microclimate, and soil give this vineyard the ability to produce both wines of depth and complexity at a great value. 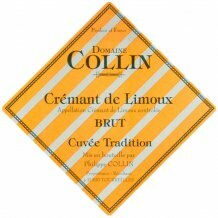 The Limoux Cremants are the grandparents of Champagne. Its birth dates from 1531 and are appreciated to this day as one of the best French sparkling wines. However, there are a large number of producers and at this time, the name of the producer makes a big difference. 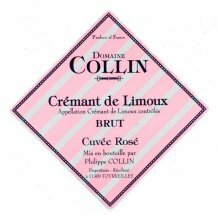 Philippe Collin is a native of the Champagne region and is dedicated to produce the typical sparkling wines of the Limoux region with the typical elegance of Champagne, with total success. Your Crémants can be compared to true Champagnes. Collin was founded in 1980. The grapes are harvested manually. Elaborated by the traditional method, with second fermentation in the bottle. This wine reveals uncommon elegance with a light frothy mousse, a fresh citrusy nose, medium body, crisp and dry. The Chardonnay gives the wine brightness and acidity, Chenin Blanc adds richness and Pinot Noir adds depth. Blending: 50% Chardonnay, 40% Chenin Blanc, 10% Pinot Noir. Harvested by hand. Soft pressing in pneumatic press. Cold stabilization for 24 hours. Racking and fermentation in temperature controlled stainless steel tanks. Second fermentation in the bottle for 3 months. Disgorged between 12 to 24 months after secondary fermentation. Dosage: between 4-10 grams. This Chardonnay based rose dressed in a pale salmon pink robe possesses a rich and lively character with Pinot Noir wild strawberry promise and Chenin Blanc enveloping aromatics. Clean and crisp minerality of Chardonnay is well balanced against zesty mouthwatering acidity. Versatile with food, outstanding on its own as an aperitif. Blending: 75% Chardonnay, 15% Chenin Blanc, 10% Pinot Noir. 1% of Pinot Noir is added into the final blend at the time of bottling. Second fermentation in the bottle. Dosage: about 6 grams. Light yellow color with excellent perlage. Thin and persistent, creating a consistent halo. White flower aromas, apple and pear fruits, sweet notes of honey and dried fruit such as hazelnuts and macadamia nuts. Tasty mouth, with a lively acidity, that asks for a second sip on the hour! Ideal as an appetizer ( just for sipping ), and the best thing is that despite the light body, it has consistency to accompany dishes such as lobster, fine fish and desserts. Blending: 75% Chardonnay, 25% Pinot Noir. Harvested by hand. Soft pressing in pneumatic press. Cold stabilization for 24 hours. Racking and fermentation in temperature controlled stainless steel tanks. Second fermentation in the bottle for 3 months. Disgorged between 12 to 24 months after secondary fermentation. Dosage: between 4-10 grams.